1 Soak the glass noodles in cold water for 30 minutes. 2 Mix together the carrots, cabbage and bean sprouts. 3 Heat the oil in a frying pan or wok and briefly fry the garlic. Add the meat and fry for 3–5 minutes, breaking it up until brown all over. Season with salt and pepper and leave to cool slightly. 4 Drain the glass noodles, cut into 4 cm | 2" lengths and add to the vegetables. Season with salt, pepper and a little sugar. Add the cooled meat mixture and mix well. 5 Lay 2 spring roll wrappers one on top of the other (the extra thickness will prevent the skin from breaking) on a work surface. Put about 2 heaped tablespoons of the filling across the middle of the wrapper. Turn in the sides and roll up to make a roll about 10 cm| 4" long. 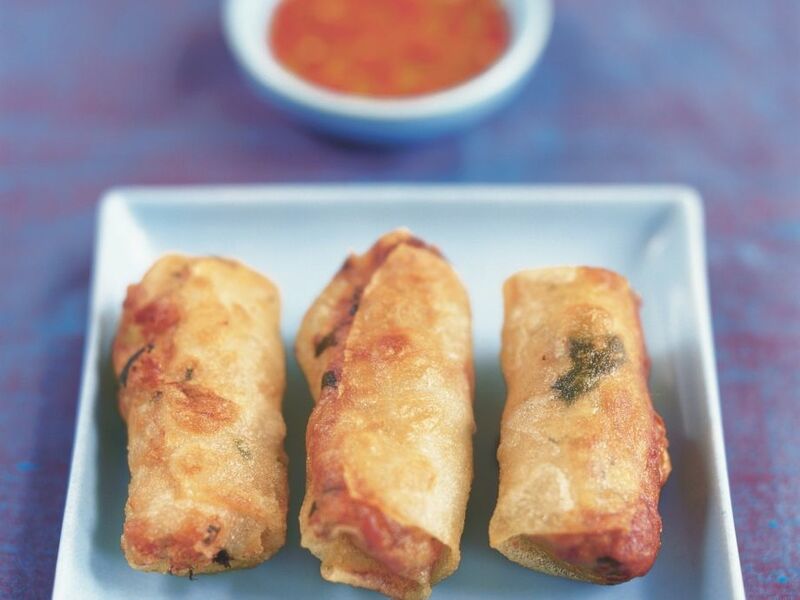 Use a little beaten egg to stick the edge of the spring roll. Repeat with the remaining wrappers. 6 Heat the oil in a wok or frying pan. The oil is hot enough when bubbles form on the handle of a wooden spoon held in the oil. Fry the spring rolls in batches for about 4-6 minutes until golden brown. Drain on kitchen paper and serve with chilli dip.